Amazon: Zoe Extra Virgin Olive Oil Only $6.45 Each (25.5 oz tin!)!!! Yet another hot Amazon deal worth mentioning . . . 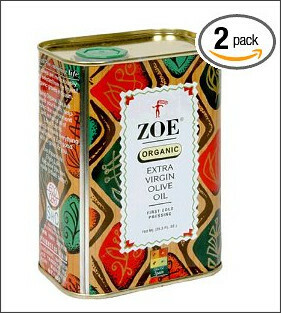 Check out the Zoe Organic Extra Virgin Olive Oil, 25.5-Ounce Tins (Pack of 2) on sale for $15.19. Save another 15% with Subscribe & Save, which brings your total down to only $12.91. I did this deal last time it was on sale . . . I'm still rich in EVOO & I use it all the time! Amazon: Vita Coco Coconut Water $1.01 EACH!!! Harris Teeter VIVA e-Vic Special!!! 1/22 ONLY! FREE Sample of Covergirl Natureluxe Foundation!! Vocalpoint: Are You a Member? FREEBIE: Sample of Nexxus ProMend! !